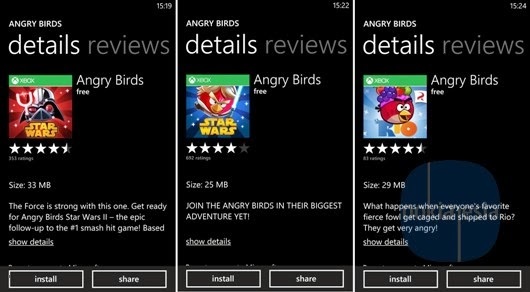 Today, All Rovio's game on Windows Phone Store are goes free including: Amazing Alex, Angry Birds Original, Angry Birds Seasons, Angry Birds Star Wars I, Angry Birds Star Wars II, Angry Birds Rio and Angry Bird Space. To get free, you should change your store region to United State for several titles and the other titles are free on Mexico region. We don't have any information, this is glitch issue or just going free for limited time.